The information that I have discoverd of this pipe seems to light from the bottom. "A friend of mine invented and patented a revolutionary smoking pipe that lights from the bottom. A major manufacturer saw the promise and bought the idea 15 years ago, but it never took off. My friend got the patent back a few years ago and we've developed a new rock maple version that we call The Freedom Smoking Pipe. It smokes cool and easy. A stainless steel screen holds the tobacco and ash in place - nothing falls out. No moisture or resin accumulate in the bowl. A cork and leather top makes it wind and rain proof. We had initial success wholsesaling through a well-known distributor. We were in about 100 tobacco shops nationwide, and appeared in the Levin catalog. Response from our early customers was strong - most loved it, some hated it. Then interest dropped off and left us wondering what happened." Abstract of US 4235252 (A) Translate this text A smoking pipe having improved smoking characteristics. 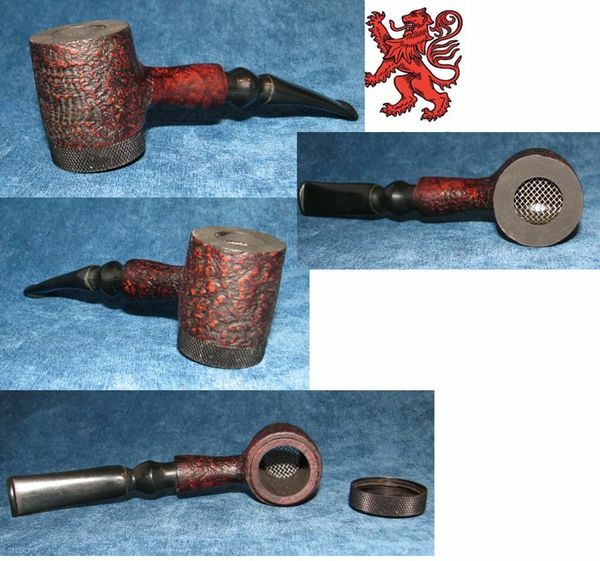 The smoking pipe includes a bowl having top and bottom openings and a breather hole near the top opening and in communication with a pipe stem. A cover assembly is attached to the bowl adjacent to the top opening and covers the top opening when the pipe is to be smoked. A retainer having a screen cooperates with the bottom opening for retaining smoking tobacco within the bowl while permitting access to the tobacco for the ignition thereof. The retainer may also be removed from its position relative to the bottom opening for the removal of ashes. Tobacco is inserted into the bowl via either opening, but preferably via the top opening and to a level just below the breather hole. With the cover assembly covering the top opening, the tobacco is ignited via the screen of the retainer, causing combustion of the tobacco in a bottom-to-top fashion. New tobacco may be added to existing tobacco via the top opening and ashes may be removed via the bottom opening, even as the smoking process takes place. The bottom-to-top combustion minimizes puddling of tobacco juices or the requirement of drying out periods and facilitates lighting the pipe in the presence of wind, rain, etc. The lack of obstruction of the breather hole by the presence of tobacco results in a smooth draw with the generation of a substantial, satisfying volume of smoke.